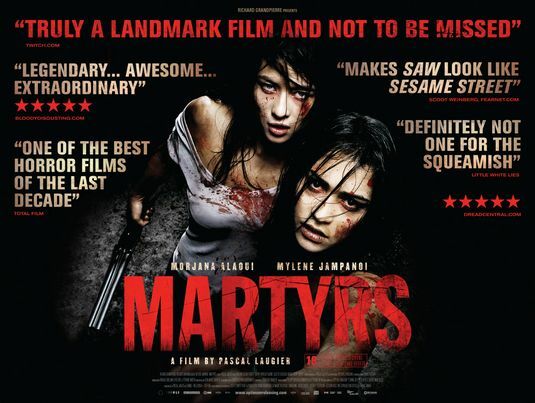 “Martyrs” begins with a young girl, Lucie (Jessie Pham), as she escapes from a disused abattoir where she has been imprisoned and physically abused for a lengthy period of time. No signs of sexual abuse are identified, and the perpetrators and their motivations remain a mystery. Lucie is placed in an orphanage, where she is befriended by a young girl named Anna (Erika Scott). Anna soon discovers that Lucie believes that she is constantly being terrorized by a ghoulish creature; a horrible, disfigured, emaciated woman (Isabelle Chasse) covered in scars. Fifteen years later, Lucie (Mylène Jampanoï) bursts into a seemingly normal family’s home and kills them all with a shotgun. Lucie calls Anna (Morjana Alaoui) to tell her that she has finally found and killed the people responsible for her childhood abuse and requests her help in burying the bodies. Upon arriving, Anna is horrified at the carnage, and worries that Lucie may have murdered the wrong people. Anna later discovers the mother is still alive and tries to help her escape, but the two are discovered by Lucie, who bludgeons the mother to death. Lucie is again attacked by the scarred creature, but all Anna sees is Lucie banging her head against the wall and cutting herself with a knife; the ‘creature’ is nothing more than a psychological manifestation of Lucie’s guilt for leaving behind another girl who was also imprisoned and tortured with her as a child. Lucie tells the apparition that she killed its tormenters and that it can rest, but it has no effect. Lucie finally realizes that her insanity will never leave her and slits her throat. She dies in Anna’s arms. Slasher Studios Remembers USA Up All Night, Do You?